Haunted stories sell like pancakes in Baguio; they are everywhere and every person has their own variation. Other than the Teacher’s Camp and South Drive where ghost stories originate, Diplomat Hotel in Baguio is another treacherous setting for an unnerving horrible story. 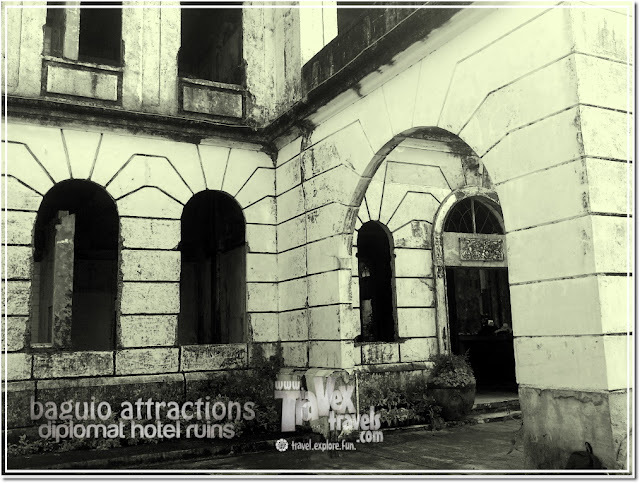 Believe me, whenever you say Diplomat Hotel when you are in Baguio, people would eventually tell you it’s a haunted place and prior cautions must be taken when planning to go there. 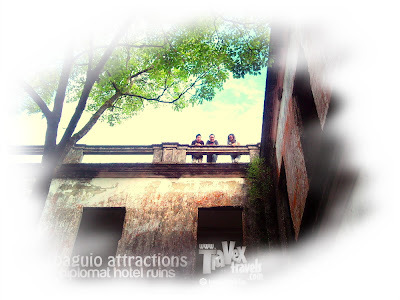 I have come across a story told by a Baguio blogger and he told me that he had experienced one. Let me tell you the story. Before the whole story, that Baguio blogger is Dean Cuanso of www.watwatworld.com. He is an Igorot and has already lived in the mountains of the Cordillera (in La Trinidad, Benguet) for years. He has already done blogging for years (the term “watwat” is a Cordillera term which means “a large chunk of boiled pork or meat”). This story happened to him in 1993, when he was still a high school student and Diplomat Hotel was still not open to public. It was a Junior-Senior Promenade that night. Everyone wants to dance with everyone. It was a party night that imparted a big slice of their memories in their high school life. It was one of their greatest nights ever, as they had their transition to maturity that time. Without knowing though, that night was also a night of unforgettable memories. And these memories are the ones you wanted to forget but you can’t. After the prom, some attendees already went home but others did not. One of which was Dean. Dean together with his friends planned to spend the night longer. 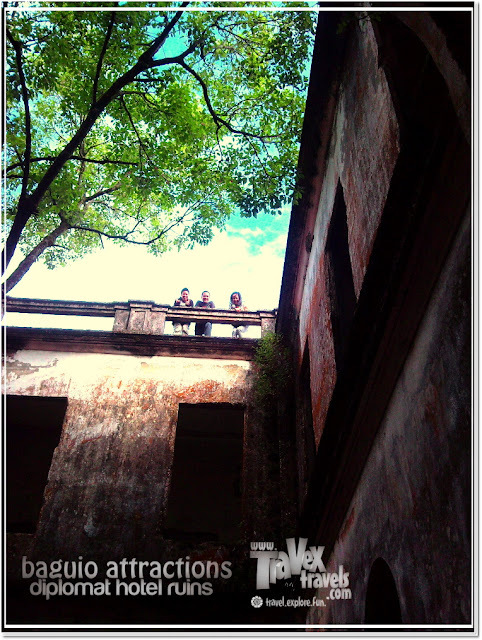 A friend of him suggested visiting Diplomat Hotel. And so they did. Nagkayayaan lang pumunta sa Diplomat ng gabing ‘yon. They are about 10 people or less as they had come in pairs; boyfriends and girlfriends had gone crazy after the prom and headed to the popular ruins of Dominican Hill in Baguio. They rode a taxi to Diplomat and it was past midnight already which totally means the road getting there that time was as quiet as what you would expect with Baguio before. Baguio before was a quiet city, unlike now, Baguio is already a booming city with a complete list of hotels and restaurants that cater foreign and local tourists. You would really expect a Pines City in 1993; Baguio is a cold, cold city and one of the many things making it a cold city is its hidden mystery. It was a cold night and a quiet place when they arrived before the gate to the Diplomat Hotel ruins. 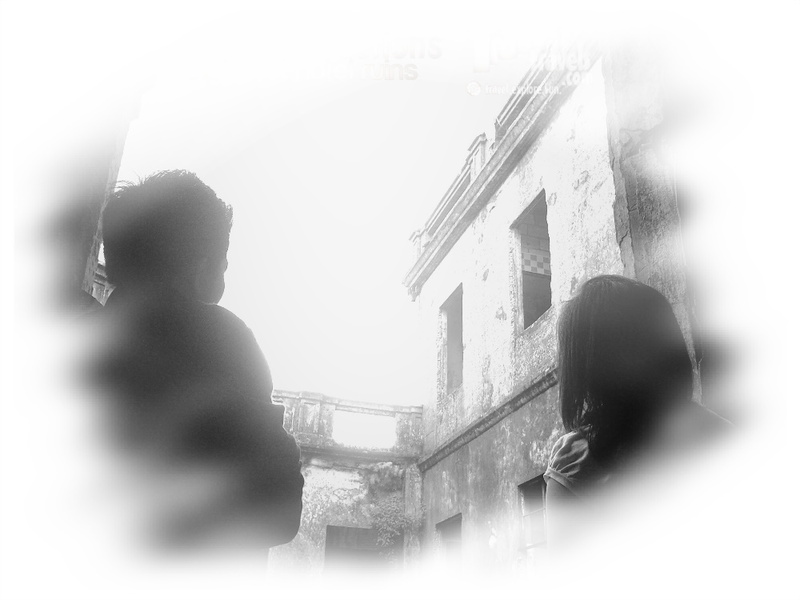 The silhouette of the ruins were there, backlighted by the bright moon and twinkling stars. They sneaked and walked as quietly as possible but the security guard’s keen eyes did not let them pass through him successfully. He did not stop them to go to the ruins; instead he let them go inside but warned them. Entrance to the Diplomat Hotel ruins. And so they went, shouting and screaming, running and jumping as the JS Prom served as their last night of totally getting together as a group. Luckily they were just warned by the guard and let them go to the popular ruins of a hotel. With no further questions asked, they went inside these creepy ruins, and the guard went out of the vicinity with no particular reason. They just saw the guard walked out of the place, packed his belongings and went outside. Maybe the guard’s shift was over OR the guard might just not have existed at all. They did not care, all they know was it was a fun night. It was a very daring night to go to Diplomat Hotel and a very dangerous adventure to hunt for ghosts there. Just all of a sudden, Dean and his friends saw a bright white ball of light somewhere afar from a part of the building ruins. No it’s not a street light, as this part of Dominican Hill stands high from the rest of the mountains. All street lights must be found below the hill, not upright. What Dean saw was a girl in white dress, probably at an average height. She was floating in the air but the face is not visible (or it might not just be there). Everyone saw it and the ticking of the clock stopped. 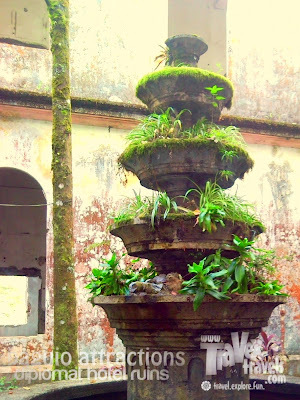 But it didn’t matter as they just continued wandering around the vicinity, staring at the old fountain, peeking on the windows of the hotel. It was a dark, dark night and a frightening place to celebrate a party. Dean and friends drank beers, so who cares if the one they saw were a mere delusion, and not an apparition. And all of a sudden, a friend of Dean fainted. They thought it was a mere joke. Nagkakatakutanlangsiguro. They thought it was a prank and every one of them just laughed. In a few seconds, this friend of Dean who fainted screamed and shouted—and what made their goose bumps is that their friend’s voice went very low when in fact she is a girl! She spoke a foreign language her friends and Dean don’t understand. But because it was a fun night of jokes and pranks, they thought this was part of the game—to simply change her voice and speak in an unknown language. They crowded over her, formed a circle and went on with the flow. Some of Dean’s friends gripped her body. She was strong. She was not her. She was not in her body. She was “him”. And all they thought it was a very good acting. Akala nila nagsasanib-saniban lang. Luckily, one of their friends had a rosary necklace. He forced it to put in her neck. Fortunately he was successful in making her wear the necklace. In a few minutes she calmed down and went back to normal. She woke up dizzily. They were all in shock including Dean. They don’t know what to say. Somebody answered him back a question. The joke they knew turned into a serious incident. They were shocked when they knew that what just had happened is no pure joke but a reality. She replied back. Everyone thought it was a joke. But now everyone spoke about it at the realest sense. After the incident none of them has already dared to repeat what they did that night. That night had already convinced all of them not to try it again. Almost two decades have already passed after the incident but Dean told the story as if it just happened last year. Yes, what happened that night is now one of the most unforgettable experiences of Dean. And whenever he and his friends who happen to be with him that night in Diplomat meet together, they would always talk about it and laugh as if they didn’t know it was a real incident. 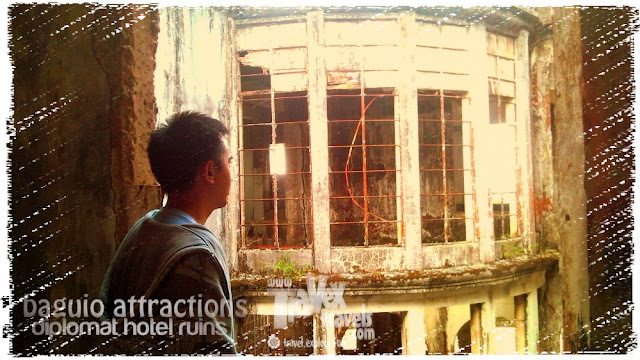 Until this moment, Dean and his friends never planned to do a reunion in the vicinity of the Diplomat Hotel. Or no one ever dared to go back in that place again. If you are not convinced with what I just told you, you can try contacting Dean, meet him up and talk about his ghost experiences. For sure you’ll have your goose bumps. Because when Dean told me the story, I dreamt of that girl, going closer to me, as closer as possible and the rest was me in a different voice. Luckily, I shouted so hard that my roommates heard it. I was possessed in my dreams. 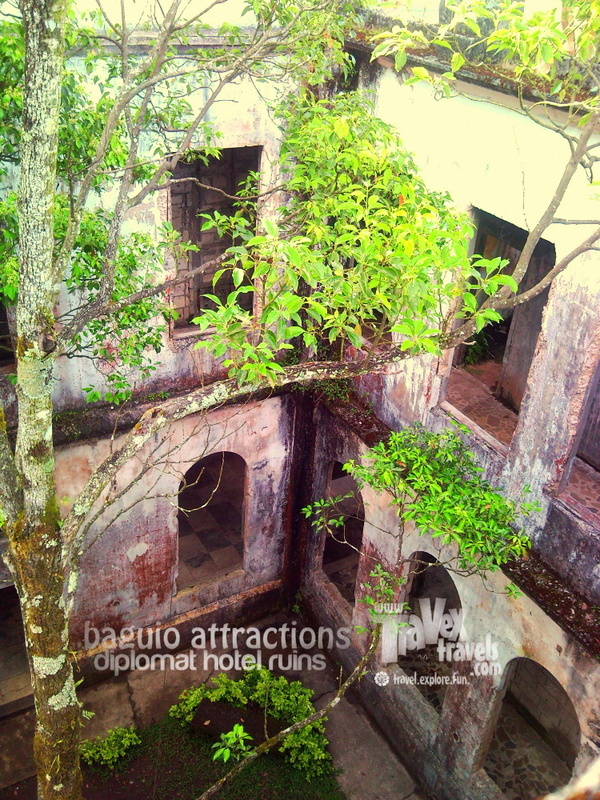 If you have experienced something unnatural in Diplomat Hotel, you can comment down here and share it. Hi there. 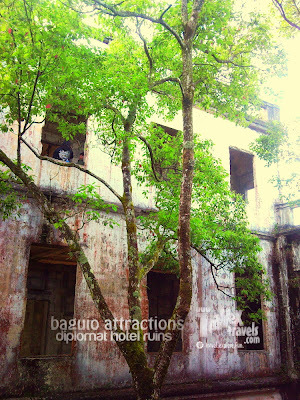 I also have a very creepy experience upon visiting the diplomat hotel. The story from above and my story are not similar. but they are both creepy by all means. So here goes: February 2014. We went to Baguio because we have a National contest to attend to. I am with my school mates and teacher. They are all boys. I am the only girl. The contest was in Teacher's Camp which is also a place with full of horror. but we didn't experience ghosts there. Maybe they were kind to us. But somehow, I feel their presence as I wander around the place myself. After the contest, we decided to tour Baguio since it's out first time there. They all suggested places like Minesview, Wright Park and those places which our Google Map says. I was so bored that I want adventure. So I suggested that we should go to the Diplomat hotel. At first, they don't want because of the horror stories there but I insisted. So being the only girl, they are all forced to come with me. Entering the gates of the hotel, already gives me goosebumps. thankfully, it's noon and sunny that time. but the trees are creepy. The guard told us na magingat daw kami kasi maraming evil encounters daw sa loob. My teacher interviewed the guard who happens to be 24/7 in the hotel. I was listening though I am taking pictures with the trees because they are enormous and old. I heard the guard said na "Iba talaga ang mga multo dyan. dati kasi tong hospital. may mga spirits dyan na faith healers. mga pari tapos mga pasyente" but I think that's absurd because maybe the guard just making stories for us to be afraid. So me and my schoolmates went inside. We are the only ones in the hotel. The quiet ambiance of the place gives me relaxation. The ambiance for me is positive. Maybe the ghosts welcome me. JUST MAYBE. Then me and my schoolmates parted ways. I went up. the others are down. I decided to take a video of my own tour. I started touching every odd thing i see like doorknobs and windows. I went to the rooms. There my heart raced. I palpitated. I don;t know why. Baka doon na yung sinasabi nilang EVIL sa hotel. but because of my curiosity. I explored more holding my phone. Nakakakilabot kasi nakakafeel na ako ng malamig na hangin. My schoolmate said, "Celine, ayoko na. hanapin na natin si Sir Cheng". but I didn't follow him instead I explored further. There in the old fountain I saw my other schoolmates. So nagsama sama nalang kami. lahat sila matatakutin eh. Ako lang ata yung matapang. kasi ako yung nagyaya. I continue to take videos where my friends make fun off. Then after that, we all went outside to the garden. The ambiance is so relaxing as ever. Then I reviewed my videos. One video caught my attention. It was a figure of a man. his face was vague. He had a black shirt and jeans. and he was standing angrily on a wall near the entrance. At first I thought it was my friend but I remembered no one of us was wearing black. I reviewed the video again and caught white figures on the corner. maybe it's light but who knows right? I reviewed and reviewed the video just to be sure and consulted my friends over it. We were still at the hotel that time. I don't know if I am just imagining or it is real but I think the boy is getting angry and angry every repeat. So I just turned it off. Sobrang creepy kasi parang yung place nagagalit din kasi yung hangin masyadong malakas na parang matatapon na kami. So we ran outside the gates where our teacher is. Tinanong niya kami, kamusta? Sabi nila okay naman. Palibhasa kasi di nila nafeel yung creepiness masyado. It was me who totally freaked out because I was the curious one. Before we left I looked back to the hotel. there i realized, It was really mysterious more than I seemed it. Until now, this story still gives me goosebumps. To those who won't believe, I cannot blame you. Before, I also don't believe it. But my experience changed it.